It is well-known that if you gain RCE as a user in the lxd group you can quite easily escalate your privileges to that of root. An example is at https://reboare.github.io/lxd/lxd-escape.html. The problem with this is that you may be on a system that has restrictive network connectivity and no installed images; thus such a command may fail. Furthermore, for whatever reason, your RCE may not be an actual shell. The easiest solution to this is to create your own image and upload that via an appropriate technique such as writing a base64 encoded file using echo and then decoding it; and one of the best of these is to use is a busybox template. We, however, aim to do better than that. First, the busybox template on our test VM (running Ubuntu 18.04). The actual container is created in /var/lib/lxc thus. We need to take a copy of the root filesystem as our baseline. We now need to create a minimal yaml metadata file for lxc. Now zip it all up and copy over to our real target. Note the size of the image. Whilst a lot smaller than an Ubuntu image it is still a good size. Yes; I'm using the same box for the lxc user demo; this wouldn't normally be the case. So as our lxc user lets make use of the new container image to gain access to a root.txt flag in the main vm. Awesome. Now let's clear up. There are numerous ways to shrink the image significantly, the best of which is to use what is already there. Remember, a key differental between what we are doing and a normal container is that we want to increase our access. So, if we are mounting the entire filesystem then what we need is most probably already there. So lets take this step-by-step. First let's replace /sbin/init (the program lxc will run) with a symlink to the host's busybox. Within the container this will be in /r/bin/. Zip it up as before. Note that as we have broken the hard link the file size is still about the same. This time let's go into a shell when we run the exploit. What happened here? It works... but doesn't. Let's have a look outside of the container. If you're use to linux, the (potential) issue is obvious. Look at the interpreter for the executable. As we haven't delt with the rest of the container that interpreter probably isn't there. Lets check. Look like this is right but wasn't the whole story. Not only wasn't it there but the host OS is using absolute paths in it's symbolic links. Lets run a quick test in the container. We're making progress. We are running /usr/bin/file but now have a so library issue. We can fix this ad-hoc by setting LD_LIBRARY_PATH or let's finish off re-engineering the image to something more useful. After clearing up this container and image, we note that /dev has the correct devices loaded by the system so we can junk the metadevices in the virtual root. Next, we note that it is probably easier to just keep /sbin as we have /sbin/init. I'll leave it as an exercise to improve on this. We also note that we don't need home, mnt or selinux in this case. We can now create a new container image. Let's test our 656 byte exploit. So we now have a 656 byte lxc priv-esc which requires no external access to an image server or pre-installed images; which is a vast improvement of the normal method. One thing that I haven't had a really good look at, coming from a non-pentesting background, is how to avoid anti-virus scanners; so here is my first serious dive into it. I suspect to most this isn't anything new to experienced testers. Given the limitations of even “smart” anti-virus products, this type of issue is expected and will not be limited to any one AV vendor. Nevertheless, I was curious to find out how easy it is to out-smart an intelligent scanner in order to get known malware past the scanner. Short answer; surprisingly easy. The setup is a Windows Vista and Windows 8.1 VM running Kaspersky Anti-Virus 2017 with updates applied. The scanner was set to High (max protection), Heuristic Analysis set to Deep scan, and the iSwift and iChecker Technology enabled. 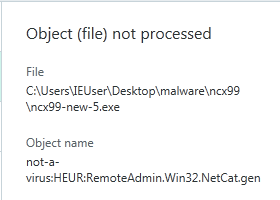 The malware is the venerable ncx99.exe. Others have tried xor encoders and many other variants to bypass the scanner, without success. So I thought I would take a different approach to find something missing from the emulator used to get malware to unpack and expose itself; finding that glitch in the Matrix. I won't cover basic XOR encoders here; Google is your friend if you wish to know. It turns out that the delta between ESP and EBP is always the same (at least on my Vista VM; a little more on that later). I created a new section with a base address of 0x13000 and size 0x1000. The exe is increased with null bytes by 0x1000 to accommodate this section. I then modify the Program Entry Point from 0x404c00 (in .text) to 0x413000 (in the new section) and ensure that .text is writeable. The key trick is that we are pushing the key and base address on the stack at 00413007 and 0041300D, but then referencing them using EBP at 0041300E and 00413011 (without ever referencing or setting EBP beforehand; we just know it gets set up like this by the OS). So in the case of Vista, we have 8 bytes followed by 32 bytes from the pushad and 4 bytes from the pushfd; total 44 bytes (0x2C). So adding a dword to the stack gives an offset from EBP of 0x30 and a further dword gives 0x34. Next, we do the usual break on 00413028 (just after the encoder) and run the program to encode .text. We then save the changes made between 00401000 and 0040A76C (we are working on DWORDs). This new file, when run, will decode .text and then run the decoded contents. Passing through the AV shows no issues. Running it creates a listener on 99/tcp which we can connect to in order to get full system access. Success. Next, I thought I would test the ability of the AV to figure out known offsets. So rather than the non-explicit connection between ESP and EBP, lets rewrite it to see if the emulator is stack-aware. This time the AV detects that it is ncx99; so it looks like the emulator in the AV is stack aware. Finally, I decided to test the approach on Windows 8.1. In this case the stack is a bit different on entry, but the delta is still consistent across reboots. i.e. a functional malware that is known to the AV product but not detected by it. This code can probably be simplified (some null actions, etc, from previous tweaks) and made version agnostic; but I will leave that as an exercise for the reader as this was only meant to be a PoC. I also tried this technique (but using some spare space at the end of the .text section) on some other programs including netpass.exe and all became undetectable by the AV file scanner. Yey. The take for me is that signature based detection is good for low-hanging fruit; stuff that is already known or similar. However, once you start customising stuff it can rapidly lose its effectiveness. Sometimes that customisation may only need to be a simple tweak, as in this example. E9 3E 50 4F 53: What comes in red pills and is highly addictive? Since passing my OSCP exam a few weeks ago I've been debating whether to add to the vastness of reviews on the PWK course and OSCP exam. It, however, feels like a right of passage; so here goes. It is marketed as an foundational course. Whilst this is correct in the grand scheme of things, don't let this fool you. It isn't “foundational” like many other courses with such branding; it is a course that will ensure you really understand and can effectively use the tools, techniques and theory that you are taught. This includes research and thinking creatively to work round problems. First, I had heard of the course, many others in the community raving about how good it is, and that people were saying it was awesome. When someone states something is awesome you may be inclined to think they are over-rating a course that they enjoyed; but when so many people in the community, some of which I know, were telling similar stories; well that is a pattern that cannot be ignored. Second, a more practical reason. Since I've left my job at a well known global telco I wanted to switch from a core infrastructure troubleshooter of last resort to a full time pen tester / security researcher. Whilst I had several SANS certifications such as GXPN, GPEN, etc, recruiters and companies in the UK were not particularly interested in them, but instead OSCP and CREST. CREST was very expensive. As I'm self funded with no income, both this and the reviews of OSCP meant OSCP was the way to go. In addition to the expected course PDF and lots of video, you get access to what is probably the biggest plus for the course; access to a lab with in excess of 50 hosts across a number of networks. This lab has a whole range of challenges, from different operating systems to applications, designed to practice everything the course aims to teach you. There are rumours that a Solaris box lurks in the shadows. Think of the PDF course as a solid and well-written step-by-step guide and the lab as the “now you know the principles, go pwn all the boxes”. You can book lab time in 30, 60 or 90 day blocks. Each comes with an exam attempt. The PDF has a number of exercises for you to do. Some are independent of the labs, some aren't. When it comes to the labs you are not given that much help (unless you really need it); it is a case of you need to figure out where and what is the vulnerability and how to exploit it; just like in real life. If after, to quote their catchphrase you have “Tried Harder” but still need help, the OffSec admins will give you hints if asked. The forums, where other students can be found, will give you more obvious hints. Though the admins will edit out any “spoilers” that a student may inadvertently add. You won't get the answer; that is for you to figure out. After all, if you want to be a penetration tester, this is a key attribute you need to have. In the exam though; you will get no hints. When doing the exercises and the labs it is good to document them. If you document all of the required exercises and ten lab boxes in a penetration test report (there is a template), you can potentially get an extra five bonus points for each towards the exam mark for a total of ten bonus points. I would strongly recommend you write this report, and before your exam. You don't want to be worrying about that as well during the report writing phase of the exam. The OSCP exam consists of a 23 hour 45 minute block of time to achieve a number of objectives within the exam network; which includes obtaining the proof.txt file in a shell for a number of targets (with evidence and recording of this in the appropriate form) proving you have admin rights. There can be other objectives for the targets such as a local.txt for an unprivileged shell. You then have a further 24 hours to write the report and submit it in the required format (mandatory); along with the lab and exercise report (optional; which you did prior to the exam, didn't you). All this is documented on the Offsec website; details of what I had in my exam (specifics) are under an NDA. See the exam guide for more info. When am I ready for the exam? OffSec are deliberately non-prescriptive on this since “it depends”. They do recommend that you should get all the lab boxes except the “big three” of pain, sufferance and humble; at which point you should have the minimum necessary for the exam, but that is no guarantee. My view is that if you get all the main lab boxes and complete the exercises in the PDF you have covered all the key areas so should have the skills necessary, but; see my hints and tips later. For me, I came from a non-pentesting role, despite my SANS certs. My expectation was that networks and systems level stuff would be relatively easier than the web app stuff, since it is in the infrastructure level stuff that my previous experience is at. Most of my application level experience involved the services rather than the apps (e.g. Java JVM analysis/tuning). Also, in my day job I had all the keys to start with so would need to improve that “black box” approach to systems. The result, some web app targets I would initially spend a couple of days to root whereas pain and sufferance were straightforward (privilege escalation including the recon was less than 15 minutes on one of them). So I guess what I'm trying to say is that we all have different backgrounds and experiences. Something that is easy for some of us will be hard for others and visa-versa. Find your weaknesses and focus on those but don't neglect any area. Use the course PDF and labs as a guide to assess and practice those skills. I took the 90-day lab option. I also took a couple of weeks off about half way through to recharge; you cannot “pause” the lab time but I felt a gap was important. Once I had all of the labs boxes bar a small number I booked the exam for a months time. This meant the exam was a few days prior to the end of the lab. I figured if I failed the exam I could then extend the lab without interruption. Others may take a different approach. I then spent the first two weeks writing the lab and exercise report for the bonus points; including re-testing the approach in the lab from a clean target to ensure a reliable exploit and that the process documented was correct. In some cases I simplified the approach as my initial success was more convoluted than needed. After that, up to the exam, I used the lab time to finish off the lab boxes I hadn't got (or had only got via Metasploit) and then redid between 3 and 6 per day without looking at the machine specific notes I had. This gave me a lot more confidence heading into the exam; especially when I was finding other ways in and doing all in a good time (sufficient that if they were exam boxes I would have passed). In the UK it looks like the earliest exam time you can book is at 10:00 (BST), so I went for that. So, exam day comes after a reasonable sleep the night before. I get up and have a few hours before it starts, I try to take things easy and not rush anything; chill out as best I can. 10:00 the exam starts and the emails duly arrive from OffSec. I set up the VPN, connect and read the exam objectives I have been given. Each objective has a points value and you need a total of 70 out of 100 to pass (did I mention there are potentially 10 further bonus points for the lab / exercise report). I notice one of the high value objectives is a very strong area for me but may take a bit of time, so for the next two hours I focus on that one whilst performing some background recon on the others. Once that is in the bag I go for lunch, during which time the first problem occurs. A power blackout!!! Arrrrgh. I shall not quote the words that came out of my mouth. Fortunately this only lasted just over five minutes, which meant my UPS was able to handle the issue (the perils living in a rural location). Time to get my blood pressure back under control and relax for the rest of my lunch. I then spend the next hour and a bit on a low value target and getting a low priv shell on another. Time for another rest. It is another 4.5 hours before I get my next success. Cycling through the remaining targets doing a bit of analysis until I feel I'm not making progress and moving on; then I suddenly spot the way to escalate privs on the one with the low priv shell. Yey; I am root. Time for dinner. Back from dinner it is then not until 21:01 that I get low priv on my next target. Hint. If you think that you have tried something and it should have worked, retry it very carefully. You may find that you could have avoided wasting some precious time. 21:19 and I now have root. Yey. Time to take another rest. I now have the final target that has been teasing me for most of the exam. However, I can now focus on this one; exclusively. 02:21 and I get low-priv. My mistake - OSCP is a foundational course so you appreciate that the solutions are easy (once you know how); this doesn't mean that if something appears complicated it is. Then 03:04 I finally get root on the last box. Final root dance. Whilst I still have access to the exam network, I review all the objectives and make sure I have met them, submitted my proofs and have all the information I need for the report. Circa 03:30 I can now finally make a direct b-line for the bed and don't need to worry if I over-sleep. The next day, or should that be later that day, I get up knowing that I now need to write the report; as no report = no pass. As I've already written the lab and exercise report I only need to do the same for the exam objectives. I can afford to take my time and not rush things. Once written I can re-read it then update until I'm happy that it is up to an acceptable standard for submission. I submit the report later that day and get confirmation from OffSec at 17:48 they have received it. At 19:47 the following day I get the results. • Read the other reviews out there. Collectively they paint a good picture about what to expect from the course and exam and hopefully you'll find at least one that is a good match for your background and learning method. • Remember this is a foundational course; so the “way in” is going to be straightforward. You still need to find it, but don't need to write a 0day or anything close to that. • If you are writing a 0day or similar it is probably a rabbit hole. • If it is too obvious to be the way-in; it might be the way in. • Whilst not required to take the exam, getting all the lab boxes except the “big three” is a good measure as to whether you are ready; though there are no guarantees. • Did I mention there are bonus points for the lab / exercise report. Writing this before the exam removes the pressure of being just short of passing and having to write that report in addition to the exam report in the 24 hour report period you have. • If you need to seek out help to get a lab box, figure out how you could have done things differently so as to avoid needing that help. Avoid if possible being too specific for that particular target. Remember; there are no hints on the exam. • Document everything; a searchable reference other than Google may come in handy. • Take regular breaks. Aim to spend no more than two hours at a time on the computer. You need to recharge, rest, relax to aid in concentration. This is a 24 hour exam after all. • Plan meals, etc beforehand so you only have to think about the exam on the exam day. • Try not to panic or stress out. If you are stuck or struggling take a time-out or move on to another target and re-visit that one at a later date. That distraction can lead to a eureka moment or allow you to re-focus on that problem when you return to it. • Read g0tmi1k's article for 'alpha' on the PWK forum (contains spoilers; so perhaps not straight away but certainly before the exam). Focus more on the strategy and approach he uses and think about how you can apply that to the other lab boxes and the exam boxes. • If you don't pass the first time don't give up. Know that many people have been there before, have come so close, but not let this stop them. If you feel like it, blog about it and how you dealt with it. This is something missing from most reviews that several people have stated would have helped. • …. and finally; beware, penetration testing comes in red pills and is highly addictive. I can safely say that the PWK course and even the OSCP exam were some of the most enjoyable I've experienced (how often can you say you have thoroughly enjoyed an exam?). What I especially like is that it is designed to get you to think for yourself. The exam tests this; and in my view is vastly more valuable than an exam that tests whether you can remember the exact switch or option to a command that you would normally just look up if you didn't know. Well, I was thinking covfefe ….. er CTP/OSCE. I got bored waiting for the PWK course to start so had a go at the pre-registration challenge and liked it. I start in a few days.